I'm headed down the road. Husband and I are leaving Alabama behind. The only reason we'd ever come back is for a quick visit and never on a permanent basis. Ahhh... but we'll see where our lives will take us. On our way to our next destination, we are stopping in Oklahoma. My husband's family ran into a bit of bad news so that will be our pit stop. Our car is loaded on the transport that is being towed by the UHaul we rented and we are definitely ON OUR WAY. I'm excited! I bid farewell to Alabama and my dear niece pictured here. She is so precious. I wish I could take her with me. The next time I blog, it won't be from here. So pray for our safety and send me good vibes as I make my way across this nation AGAIN (just six months since I crossed this nation the first time). SO happy for you Coreen! Drive safely and pray your whole trip down! I hope to visit yall in utah now that all a yall are there. 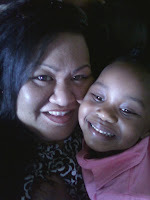 lol Tupu is coming down the end of this month and Miss will be visitin us soon. Faga them are here so hope to spend some time with her while she visits. Miss ya lots and love you! like my Tutu says - "As long as these two legs work, I'm MOVIN!" I say GO FOR IT, enjoy the journey, and travel away! Have a great time on the road! Yay for moving, Coreen! I know you weren't so thrilled about Alabama--here's to a fabulous, fulfilling adventure for you guys. Lots of love, travel safe! Can't wait to see you guyz...hopefully when Retz comes 2 visit it'll be a permanent one!lol..(i'm hoping). Be safe & don't 4get 2 call when u get in! luv ya!